MAKO SHARK II: Head over heels in love ever since. "The Mako Shark II show car made it's first public appearance at the New York International Auto Show in April, 1965. It's lines were the culmination of two beasts of the oceans, the Manta Ray and the Great White Shark. It was timeless. This one was truly a Bill Mitchell inspired car with the narrow waist or coke-bottle shape and pronounced fenders. Bill and Zora didn't agree on the design at first. But this was in the era when design came first and engineering then got to work within the major parameters we set. There is always some confusion about the Mako Shark II based on different photos. There were, in fact, two primary versions of the Mako Shark II and then the Manta Ray version. So three basic versions with quite a few re-paints and minor changes over the years! The first Mako Shark II, as shown at the New York show in January 1965, was a non-running model with the outside side pipes rising up into the front fenders. It also sported some interesting, futuristic details, such as a squared-off steering wheel. The interior of the Mako Shark I got a lot of criticism, particularly the steering wheel which was a small rectangular piece with controls for turn signals and transmission built-in. By the Paris show this was changed to a more conventional wheel with the main controls moved to stalks o the steering column. Most of the 'informational" gauges were placed on the passenger side of the instrument pod, while the drivers side instrument panel had only the tach and speedometer. In addition to the gauges, there was also a system of warning lights for all major fluid levels and another series of lights to warn of open doors and the like. The second Mako Shark II, first shown at the Paris Auto Salon in October of the same year, was a running model with more conventional rear-exiting exhaust system. The exposed ends of the exhaust were quite highly styled in a boxed and finned arrangement much like Larry Shinoda had done for the SS Racer. It also had a retractable rear spoiler, and a square section bumper that could be extended for added protection. There were other interior features which may yet come to pass as standard features. In Mako Shark I and II, the seats were fixed and the accelerator/brake pedals moved on a one-piece control board. Adjustable pedals have since been used on race cars and show cars; they may yet find their way to street cars as a way of increasing the "fit" for a wider range of driver sizes, especially as we come closer to acceptance of drive-by-wire features. The Mako Shark II was powered by a 427 Mark IV engine, which became available on production Corvette models. The paint scheme continued the Shark I tradition, with blue/gray on top and silver/white on the bottom (along the rocker panels). The were several core design elements which were common to both the non-running and running models, of course. The basic design included the chopped roof, hinged roof panel which raised to permit easier entry, the sharp-edged fender lines, highly styled front clip, hood bulge and upswept tail. There were lots of other gadgets thrown on the car as repeats from Mako I, including the prism-type periscope rearview mirror, the pop-up brake flaps, James Bond retractable bumpers, and the louvered rear window treatment. When the car was converted to Manta Ray in 1969 the louvered window concept was dropped in favour of the more conventional sugar-scoop arrangement. Initial high speed tests revealed that the car was unstable at high speeds. The nose was too low, the front fenders were too high and obstructed the driver's visibility. Rear visibility was next to nothing and the overall 'lift' of the car at speed was unacceptable. So much work needed to be done that there just wasn't enough time for a 1967 introduction for the new body style. 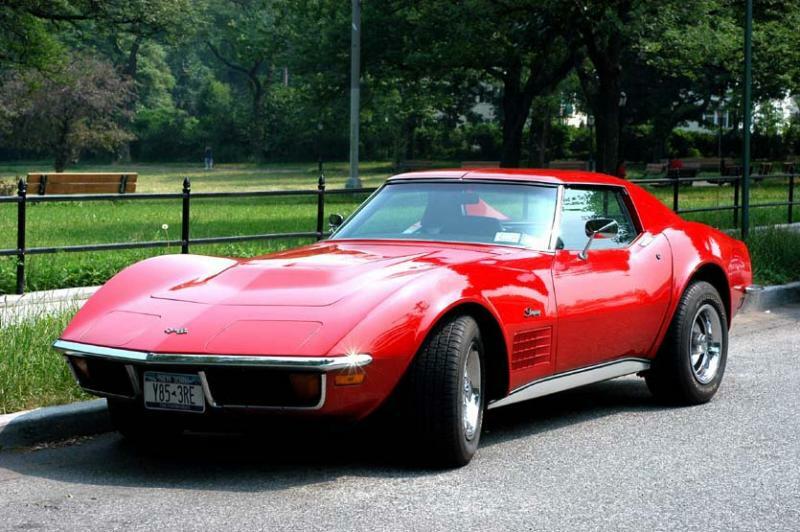 1968 would be the year that we would all see the newest Corvette. The front and rear fenders were more proportional, visibility was good, lift was minimal with the standard front air dam, and of course, the legendary 427 big block engine was available in 5 different versions." My '72 Vette "Mary:" Her style derived from the Mako Shark II. I was at the April 1965 New York International Auto show, and saw the Chevrolet Mako Shark II concept car in the fiberglass flesh. To say that seeing the Mako Shark II in person, had a crushing and everlasting impression on me, would be accurate, yet somehow lacking in adequate superlative terminology. Here it is, 47 years later, and I'm still head over heels in lust with this body style. At the time, I was saving up to buy a used Corvette, and had been saving this bread since the age of 13. I was so seriously smitten with Vettes since the age of 13, that I embarked on saving for my used Vette with a seriousness, worthy of an adult. So single minded was I on my acquisition of a used Vette, a heady coup that I was able to achieve at the age of 19, that I thought of little else in the 6 years it took me to accumulate my treasure for the car. I knew that someday, I would own the Ideal Vette styled car. It was predictable. The 1965 New York International Auto show took place at the old New York Coliseum (yes, that New York Coliseum where the Aliens M.C. had that famous turf war with the Pagans M.C. which led to the Aliens becoming the New York Hells Angels) at Columbus Circle. I went to the show with my friend Wille Ng, who was like a Chinese-American WWF wrestler weighing in at 230. Willie and I had been good friends when we first met at the age of 8. Wiilie's parents also had a Chinese laundry in Jackson Heights in Queens Willie was this dynamically stout and wide kid, about twice my size. He had incredible strength at the age of 8. There was this empty lot next to my parents' building, with a wooden picket fence bordering the back of the lot. On the day I met Willie, I was playing in the back of the lot where this fence was. I was trying to pull the slats off of the fence, with no success. Over comes this hefty kid, and starts peeling off the slats as easily as peeling ripe bananas. That, was Willie at age 8. Willie and I strolled into the New York Coliseum, and there stood the Mako Shark II, looking every bit as sinister and overpowering, as photographs you see now, hint at. However, in person, this Nuclear Weapon of a concept car, literally rocked bystanders back on their heels, the way an invincible football offensive unit pushes an unsuspecting defense down the field, without effort and full power ahead. The Mako Shark II was majestic and explosive-looking, outstripping the self-limiting, one-dimensional boundaries of photographic capability. At the time that the Mako Shark II show car debuted at the New York show, I was already in love with the "C2" style (Vettes made between 1963 and 1967), so when it came time to pull the trigger with my three grand of cash in hand, after having found a pristine '64 Corvette Sting Ray at a Queens Boulevard used car lot, I bought this beauty. But in the back of my mind, the concept of the Ideal Vette had already began to make a perceptible shift to the Shark Style, as embodied in the Mako Shark II. I made peace with my compromise at the time, but someday I vowed to capture myself a shark. The production cars that eventually were made by Chevrolet based on the Mako Shark II design, are known as the "C3" generation. Even though the C2s and C3s are identical cars under different body styles (they share the same chassis), it is the mesmerizing looks of the C3 that has me forever enthralled, even at this late date almost a half century later. You've often read that after a ride on my Harley 74 "Mabel," that I just stand there and take in Mabel's righteous lines, visually. This is a cathartic ecstasy of the mind, that must be somehow similar to the effect of psychedelics. Hey baby, lookin' at my stroker shovel motorvated four-speed swingarm, is a trip! And so is looking at Mary. After I park Mary in her Delancey Street garage in the Lower Beast Side of NYC, I without fail will linger a few minutes, just absorbing her brutal and curvaceous beauty. Those flared fenders, muscular and aggressive, suggest movement and strength while standing still. Those sensuous lines, man, seem like legs that never stop short of Nirvana. That sweeping hood, covering that classic small block Chevy, it inspires and motivates to go the distance with this girl, just as my Harley inspires. To those in the Motor Culture, machines display unerring loyalty that demands reciprocity from their human partners. In retrospect, the Mako Shark II was an exaggerated version of the later production car. It may seem over the top, compared to its production sisters, that were introduced in 1968. The fender flares were cartoonish compared to my Mary's, yet it was such a fresh and bold design in 1965 that it blew my mind, and ruined for me forever, any appreciable devotion to any other Corvette style. Like I see the shovelhead motor as an "improved" panhead, I see the C3 Corvette as an improved C2. To my eye, the 1972 styling of my Vette is a cleaned-up and sleeker iteration of the Mako Shark. Yet, Mary's lineage as descended from the seminal Mako Shark II design, is unmistakable to the casual eye. I love motorcycles. I love cars. There is an undeniable visual experience with the ownership of either, that goes beyond mere functionality and performance. Man does not live by 0-60 times or cornering ability alone! One's aesthetic mind must be fed, just like Grace Slick used to sing about feedin' yer head. How's that for food for thought? Later.